Is ‘Killer Crow’ Next on Tarantino’s To-Do List? Currently enjoying critical spoils and many award nominations for his new film Django Unchained, Quentin Tarantino is now, of course, talking about his next effort. So where will Tarantino take us next? That Vega Brothers movie he’s mentioned before, or a Prohibition-era gangster flick? How about a trip back to World War II? “…My original idea for Inglourious Basterds way back when was that this [would be] a huge story that included the [smaller] story that you saw in the film, but also followed a bunch of black troops, and they had been f–ked over by the American military and kind of go apes–t. 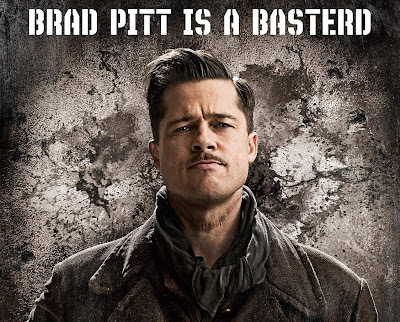 They basically — the way Lt. Aldo Raines (Brad Pitt) and the Basterds are having an “Apache resistance” — [the] black troops go on an Apache warpath and kill a bunch of white soldiers and white officers on a military base and are just making a warpath to Switzerland. Sounds like quite the Tarantino-esque project, but I think it would be nice if he’d move in a direction that has nothing to do with revenge or a period piece. Of course, I’ll be lining up to see it if it comes out though. What do you think, Bastards? Killer Crow: yay or nay? So this kid made a mashup of “Toy Story” and “Inglourious Basterds” for a class project. I have no idea why a young person was permitted to see “Inglourious Basterds,” but whatever. The end result is interesting. Thanks to Nerdist for posting. Eli Roth Announces “Thanksgiving” Plans!! Roth added that he is penning a script for the horror flick “Thanksgiving,” which originally appeared as a faux trailer for Tarantino and Robert Rodriguez’s “Grindhouse.” He is directing, producing and possibly acting in the film. One of the funnier trailers with more of the gruesome visuals and an even more disturbing voiceover. I’m psyched Roth is getting back to writing and directing. He is a good actor, but I love his innovation behind the laptop. Score one for the horror fans. According to figures released today by distributor Universal Pictures, “Basterds” German boxoffice has topped €8 million ($11.4 million) with more than 1 million tickets sold. Weinstein also had the No. 3 slot with the horror flick “Halloween II,” which opened with $17.4 million. The movie is Rob Zombie’s sequel to his update of the slasher franchise about crazed killer Michael Myers. It’s unusual for two horror movies to open over the same weekend. While “Final Destination” and “Halloween II” competed for the same audience, both managed solid receipts. “They got their $17 million, we got our $28 million. That’s a lot of business all around,” said Jeff Goldstein, general sales manager for Warner Bros.
What are you gonna do? Be happy, TRUE BLOOD AND ITS SEASON FINALE ARE ON NOW AND THIS WEEK!!!! Is there a scene in a movie you can’t watch? A scene that is so blatantly disturbing that it comes back and haunts you. Maybe not in your dreams, but something that even during your waking hours you slip back to and get bothered by. If you really think too long and hard on those scenes you can discern that while yes, it isn’t really happening, you have that graphic visage burned like a brand onto your brain. Your thoughts twirl and come and go like smoke, and no matter how hard you try, no matter what if anybody even brings it up you feel as if the best solution would be corking your ears and screaming “La la la!!!”. My number one slot is something that has bothered me for ten years now and I don’t even want to write it. I don’t want to rethink about it while committing it to screen. Yes, it ain’t real, but it certainly left its scent on you, and regardless of scrubbing, you won’t get it’s filth out of your mind. That either means the film is EXCELLENT or absolutely TERRIBLE.